"Oho.. I see!" Souichiro replied as he stroked his beard, entering the room as she explained about the estate. He sat at the table on one of the cushions and made himself comfortable. "This is very nice for a guest area.. I've certainly been in my share of worse ones and this is probably the better one I've been in to date!" By this point, Hayate had given up trying to second guess the man and instead decided on warning the girl of Souichiro's legendary perversion next time she gets a chance. Maybe that'll be enough to keep her dealings with him to a professional level only. "So! Where are your family members? I'd like to meet your grandfather at the very least." Souichiro spoke up after a minute of contemplation. 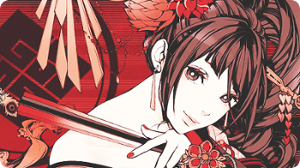 Yuzuki appreciated the compliment, a smug smile gracing her features. "Of course! Guests are sacred, they must be treated with respect. Besides you helped me, it is the least I could do!" "Grandfather is a busy man, but I am sure he has noted your presence and will be arriving shortly." Yuzuki nodded, though she heard the familiar footsteps coming down the hall stop. As she spoke, the door opened and a large burly man walked inside. Despite his shockingly white hair, glorious beard and copious wrinkles, he was a beast of a man with obvious muscles under his clothes. A serious expression on his face, he bowed formally to the Captain. "Welcome to my home, Captain. I am Lord Morinaga. Yuzu never brings friends so this is a rare treat. You may call me Hiro." He moved to a seat at the table, his expression still solemn as he set a large book on the table. It looked as if it was a picture album. Yuzuki just grinned and served tea for both men. "Ahh, so this is your grandfather?" Souichiro asked as he rose to greet the man, bowing in return, then sat again. "I thank you both for having me here. So what's that you've got there? A photo album?" Souichiro's eyebrows raised in interest as he sipped his tea. "Will I get to see adorable Yuzuki as a baby?" He asks, flashing a grin. "Yes, that is he." Yuzuki nodded as Souichiro rose, watching them politely. "You are most welcome!" "Oh yes. We rarely get to show off, so I apologize for my haste. However a friend of Yuzuki's is something that must be treated with the respect such a position holds." The Grandfather nodded, opening it to its first page. It stated in perfect characters Yuzuki's full name, her title and a few other things such as the date and year it covered... Yuzuki looked pleased and scooted closer. As the large finger flipped the pages gently, it opened to... Dogs. Well one dog, a puppy with almost shining white fur. Little bits of red shone through the fur in places. In these pages, the puppy was dressed up in booties, little raincoats. She was holding umbrellas, playing with toys, being held... Some pictures had a much smaller dog in it, the same white with red in places though it was obviously fully grown. "Oh look Granpapa, they caught your pretty eyes in this one! I can't believe you fell off my back though. You have to be careful!" Yuzuki leaned over and pointed at a picture of the puppy with the tiny dog, the tiny dog slipping off the larger half grown puppy's back and looking shocked. Souichiro blinked blankly as he stared at the pictures, thinking they were showing off the family pet. But something gnawed at him in the back of his mind.. that piece of cloth that Yuzuki brought him that was a bit bloodstained. Nah, that couldn't be right.. He thought, but just for safety's sake he'll ask. "Might I ask who the little puppy is in this picture? Its quite adorable!" He says conversationally, hoping it'll come up that way. Hayate on the other hand was rather amused at how this turned out. Whatever Souichiro was planning was now ruined, so to speak. Even he couldn't bring himself to carry out his nefarious deeds now, right? RIGHT?! Yuzuki and her grandfather blinked as one and turned. They had been in a slight argument about who had been winning that game of tug of war in this picture when Souichiro had spoken up. Yuzuki held up the book next to her head and motioned. "Can't you tell? It is me. The other one is Grandpapa, the tiny one."